Marsala Oxford Booties, Marsala Tights and Jeweled Tee. Welcome to Marsala Week which also happens to be the second week of March. Crazyyyy! I will start off today with two items (of mine) I have worn a lot lately: My Marsala Oxford Booties and my Marsala Semi-Opaque Tights. However, stay tuned because I will show you all of my new haul of Marsala/Burgundy/Wine/Maroon Stuff the rest of the week. =) Also, this week I will be showing several other new items I have recently added to my closet (some not as recent, maybe as long as 5-6 months ago, but that hadn't been worn lately - gasppp!). This is the last outfit left over from Valentine's Weekend this year. I saved it for this week since it is Marsala Week. The new item here (besides my Tights) is this Gray Jeweled Tee by Zara. I wore the same tee to work during the day on February 13th. For a one-year old's Birthday Party, we had to go to that evening, I decided to dress up the tee a little. So I wore my neglected Faux Leather, Quilted, Black Skater Skirt with my Zara Jeweled Tee and my Pink Flower Cardigan over it. I mixed Pink with Burgundy while leaving the Black+Gray be the neutrals for this outfit. I even kept on the same Jewelry as what I wore during daytime. I ended up really liking the fun and girly results in this outfit. Below I linked up nice options like my Jeweled Tee, Booties and Skirt. I wasn't able to take one decent photo of my little Vivian. She was playing with the other kids, moving and shaking the whole time during the Birthday Party. But I had to share her cuteness and her pretty (new) Sweater Dress nevertheless. Love this Polka Dot Sweater Dress she wore. It has a fun, large bow off the neckline. My brother bought it for her as one of her Birthday Gifts this year. He has good taste. And here is the little birthday girl, Alina (with her mommy). Black, White & Hot Pink, Floral, 3/4-Sleeve Cardigan w/ Logo Silver Buttons: White House Black Market (similar sleeveless option, love this), (gorgeous hot pink floral option, great deal, love this), (baby pink option, best deal, love this). Black, Faux Leather, Quilted, Skater Skirt: One Clothing (Marshalls) (very similar, on sale, love this), (similar w/ trumpet ruffle by Charlotte Russe, best deal, love this), (pleated option by Charlotte Russe), (faux leather Marsala option, for 7 Bucks!! love this). Burgundy/Wine Leather Suede Oxford Booties w/ Chunky Heels: Caterina Firenze (New) (similar gorgeous option by Christian Louboutin, Splurge), (similar wedges in burgundy suede, great deal, love these), (similar in black, best deal, love these), (similar wedges). Fuchsia Sweater Dress w/ Gray Polka Dots & Large Gray Bow by the neckline: Little Lass (Gifted). Fuchsia Leggings w/ Ruffled+Sequined Heart off one Leg (on the bottom): A Random Children's Boutique. Bright Pink Polka Dot Bow Barrette w/ Smiley Face: A Random Accessories Boutique. I also wanted to (very late I know) share with you my (faux) mantel decorated for Valentine's 2015. I have made that little red tassel decorating the little pomegranate silver jar and that white bucket with the pink ribbon woven through it. I wanted to share this with Style Bloggers for the Something I Made link-up. P.S. 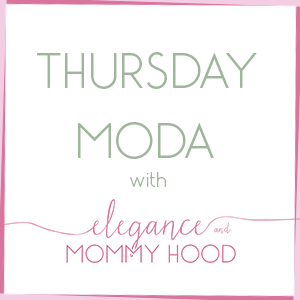 Linking up with Carylee + Gina, Ellen, J., Jen, Laura, Lauren, Natalie, Rachel, Rachelle, Rhea, Time for Mom, Whitney and Zaz.